Where did you hear about the AUoD? 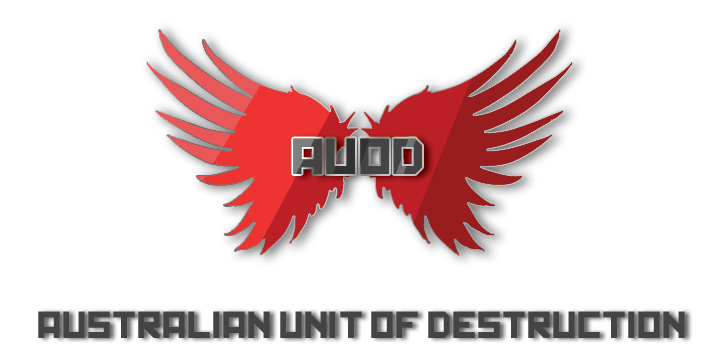 : I heard about AUoD from a topic on the Killzone 2 boards over at GameFAQs. Why is it that you want to join? : I want to join so that I can easily get online with friends and have lagless games with my fellow aussies/kiwis. It makes that game that much more fun. Also playing with a clan tag makes me more motivated, as I am representing the clan. Do you have a Headset? Yes. Damn capslock >_> post heaps and play more (yes I've said that to the last 3 new users)! what other games do you have, play regularly? If you have W@W we will probably play some games tonight if you want to have a "meet" with the clan. Welcome, hope to play with you soon! W@W or Motorstorm or whatever! post heaps and play more (yes I've said that to the last 3 new users)! I swear it's been more than that. But welcome grince! Join us on W@W tonight if you have it. I'm doing pretty well, this is like the 6th member I've recruited for KZ2. I am currently playing Resistance 2, WaW, Crash Commando, LittleBigplanet and other non-online games. What time are you guys going to be playing CoD? Welcome Grince, im playing most of those games too. PSN: Chookz if u wanna play. it helps that killzone is gonna rock. anyways welcome grince! PSN the same as my name. hope to see you online for a good session! We've been playing W@W all night, you should have added one of us. I invited him, he was in the very last game we played. ^ I found W@W not that .. great. Can you play Zombies online? welcome man! dont be afraid if we call you babe, its standard practice around this neck of da woods! keep active, and my psn is the same as my name pretty much! Lol, yeah I noticed that you call eachother babe.